Recently, we were interviewed by Newsshooter, a leading filmmaking site. We’re so honored to be able to share our film with them. It’s not often you get to be on one of your favorite sites that you read every day. We rely on this site for its expert technical reviews and are constantly inspired by its in-depth interviews with filmmakers, video journalists, and other creative professionals. Thank you to Matt Allard and the Newsshooter team for this huge honor. 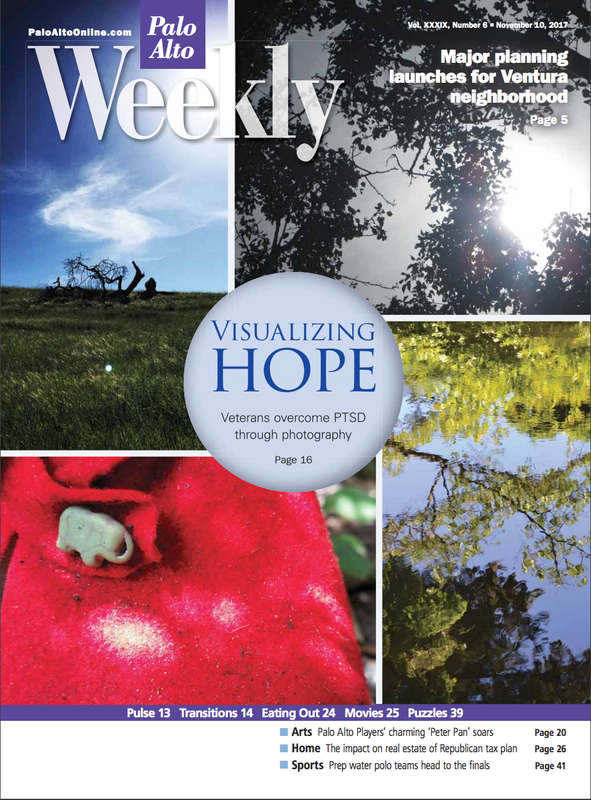 The Veteran Photo Recovery Project is the cover story of Palo Alto Weekly—“Visualizing Hope: Veterans Overcome PTSD through Photography.” We’re excited that this incredible program is being showcased in this publication that serves the Palo Alto community and beyond. Hopefully, this cover story can help raise awareness about the program and the power of innovative photography therapy to treat rising veteran mental illness. We deeply appreciate the Palo Alto Weekly helping to publicize our screening of “Visions of Warriors” at the City of Palo Alto / Cubberley Artist Studio Program (CASP) Open Studio Event on Saturday, 11/18/17, from 3:00 p.m. to 7:00 p.m. at the Cubberley Community Center in Palo Alto. Thank you to Sue Dremann and Palo Alto Weekly for their generous support. “Visions of Warriors” is covered in Feature Shoot, one of our favorite photography sites. According to the site, “Feature Shoot showcases the work of international emerging and established photographers who are transforming the medium through compelling, cutting-edge projects.” We’re so honored to be part of this great site. We’re always inspired by all the amazing photography and the talented photographers behind it. Our documentary is not only meant to raise awareness about the rise of veteran mental illness and the power of innovative photography therapy to treat it, it’s also a love letter to the art of photography, which has given us so much. Thank you to Ellyn Kail, Aison Zavos, and Feature Shoot for this incredible honor. “Visions of Warriors” is covered in the USA Today Special Edition Veterans Affairs 2017 article, “Mission Recovery: New Documentary Highlights Program that Gives Veterans New Lens on Life.” We’re deeply honored to be a part of this great publication focusing on veterans and coming out during Veterans Month. Hopefully, through its wide circulation, it raises awareness about the rise of veteran mental illness and the power of innovative photography therapy to treat it. “Visions of Warriors” will be released on Veterans Day (11/11/17) on Amazon Video Direct, Apple iTunes, Google Play, and Vimeo on Demand as well as on our site: visionsofwarriors.com/store. Thank you to writer Kristen Schmitt, Sara Schwartz, and USA Today for their in-depth coverage of “Visions of Warriors" and the Veteran Photo Recovery Project. Recently, we were included in the Talent Feature section of the great filmmaking website, cinema5d.com. Thank you to Johnnie Behiri, Nino Leitner, Sebastian Wober, and the entire cinema5D team for this huge honor. We’re big fans of their site, which is one of our daily reads. As filmmakers, we’re constantly learning. The tech reviews are always informative, and the talent features are very inspiring. We deeply appreciate this wonderful opportunity. Recently, we had the pleasure of being interviewed by the respected San Gabriel Valley Tribune. Because our business is located in the San Gabriel Valley, we were excited to be interviewed by our local newspaper and share our feature documentary with our community. Thank you to Titus Wu of the San Gabriel Valley Tribune for interviewing us and Walt Fogler-Mancini, Pasadena photojournalist of the Southern California News Group for his kind referral. 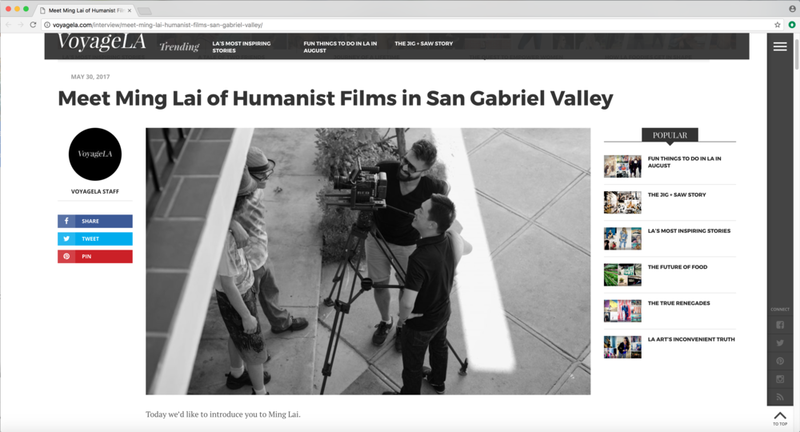 HUMANIST FILMS IS INTERVIEWED BY VOYAGE L.A. Recently, we had the honor of being interviewed by Voyage L.A., a cool site about Los Angeles and its dynamic people. Based in L.A., we love our hometown. So we can’t help but appreciate fantastic sites like Voyage L.A. that showcase our great city. Thank you to Mike Bhand of Voyage L.A. for interviewing us and Sari Makki-Philips of Sari Makki Photography, one of our favorite companies, for her thoughtful referral.